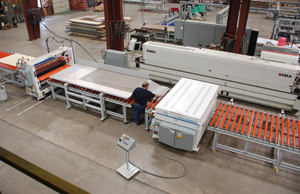 Semi-Automatic Laminating Lines – Creative Automation, Inc.
Creative Automation builds custom designed Laminating Lines that integrate cleaning, coating and curing for lower volume panel production. This particular line laminates HPL on particle board and MDF with PVA glue. 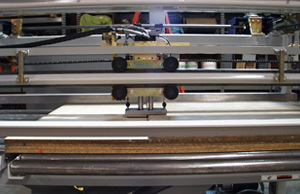 Automatic pusher feeding panels into the gluespreader.